Recombinant monoclonal antibody to CD4 . Manufactured using AbAb’s Recombinant Platform with variable regions (i.e. specificity) from the hybridoma CE9.1 (Clenoliximab). Alternative Name(s) of Target: p55; T cell surface antign T4/Leu-3. Immunogen: Domain 1 of human CD4. Specificity: The antibody binds to human CD4 with a Kd of 1.0 nM and an ED50 of 0.2 ug/ml. 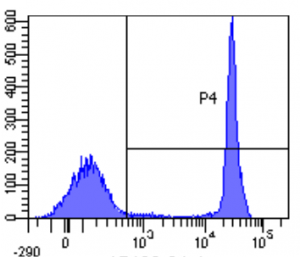 Application Notes: The antibody binds specifically to CD4, a molecule which is part of the immunolgobulin super-family, expressed on the surface of helper T cells. The CD4 molecule acts as a co-receptor in the activation of T cells, aiding the interaction between the TCR and MHC II of the antigen-presenting cell. The antibody is classified as "primatized", as the variable regions of the light and heavy chains are obtained from primates, while the lamda light chain and γ4 heavy chain constant domains are human. The antibody was engineered from the primatized IgG1 monoclonal antibody Keliximab by substituting two key residues. The role of the antibody as an immunosuppressor has been tested in vivo, by intravenous administration in chimpanzees and human volunteers. The antibody reached Phase II clinical trials with Biogen-Idec. Note on publication: Describes the method of producing "primatized" antibodies, where immunoglobulin genes from cynomolgus monkeys immunised with human CD4 are isolated, amplified and then cloned. The antibodies generated are against the CD4 molecule expressed on the surface of helper T cells, and are tested for both in vitro and in vivo use. WB on human thyroid tissue using Ab00450-13.0. Western Blot using anti-CD4 antibody CE9.1 (Clenoliximab) (Ab00450) Human thyroid tumour samples were resolved on a 15% SDS PAGE gel and blots probed with the human IgG4-chimeric version of CE9.1 (Ab00450-13.0) at 1.5 µg/ml before detection using an anti-human IgG4 secondary antibody. Protein was detected by chemiluminescence. The expected unmodified running size for CD4 is 51kDa (arrowhead). Here some non-specific bands can also be seen. Ab00450-13.0 successfully detected CD4 in human thyroid tissue samples. 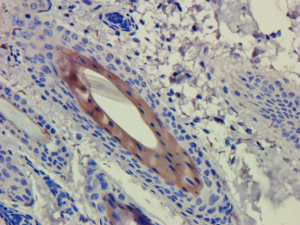 IHC on guinea pig skin tissue using Ab00450-13.0. 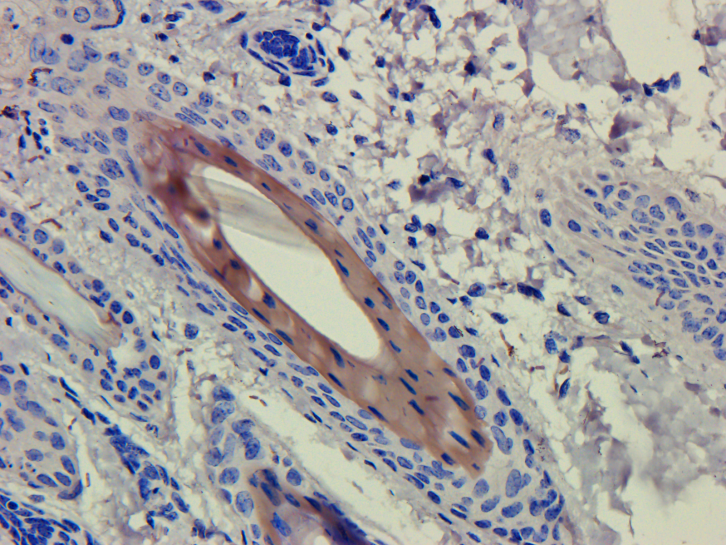 Immunohistochemical staining of guinea pig skin using anti-CD4 antibody (Ab00450) CE9.1 (Clenoliximab) Anti-CD4 staining of formaldehyde fixed paraffin embedded guinea pig skin tissue, at 40x magnification. The human IgG4-chimeric version of CE9.1 (Clenoliximab) (Ab00450-13.0) was used to stain samples at a concentration of 3 µg/ml. 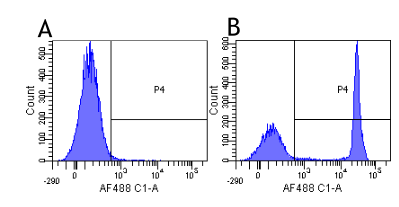 Flow-cytometry on human lymphocytes using Ab00450. Flow-cytometry using the anti-CD4 research biosimilar antibody Clenoliximab (CE9.1, Ab00450) Human lymphocytes were stained with an isotype control (Ab00102-23.0, panel A) or the rabbit-chimeric version of Clenoliximab (Ab00450-23.0, panel B) at a concentration of 1 µg/ml for 30 mins at RT. After washing, bound antibody was detected using a AF488 conjugated donkey anti-rabbit antibody (ab150073) and cells analysed on a FACSCanto flow-cytometer.